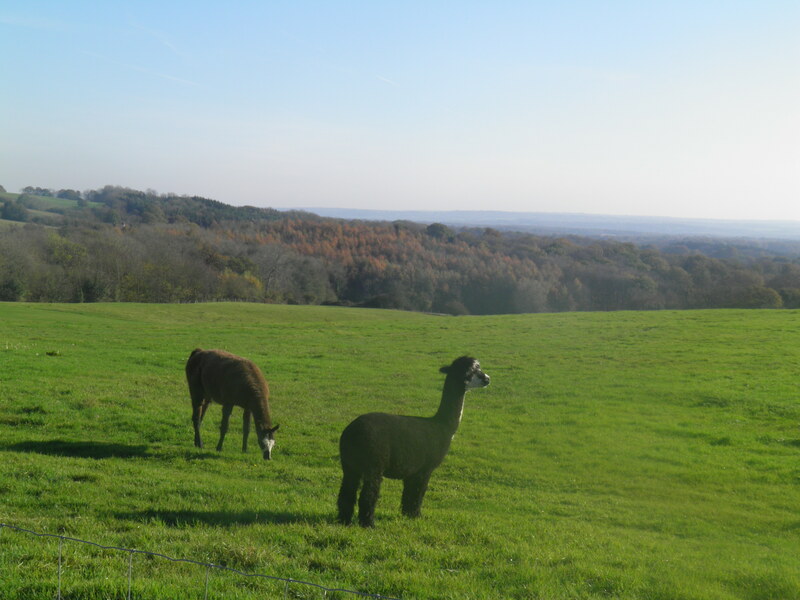 A meander through the lush fields of the Low Weald, before gaining the beech woods and sweeping views of the High Weald, passing Churchill’s country home at Chartwell. Underfoot: Mixture of field paths, minor roads and forest trails. Sections through farms and some of the woodland portions will be muddy in winter or after wet weather. Good shoes recommended. Terrain: A few steady climbs, particularly in second half of walk, but nothing very taxing. Route finding generally easy. Getting there: Penshurst is served by hourly Southern services from London Bridge (57 mins), via Norwood Junction (46 mins) for London Overground connections and East Croydon (42 mins) for connections from London Victoria. On Sundays, it is sometimes necessary to change at Redhill. 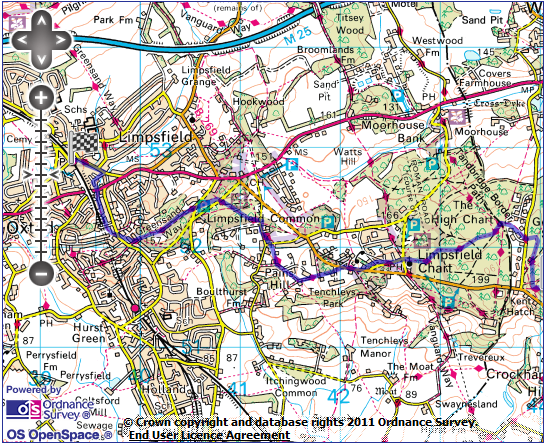 Useful websites: Much of this route follows the Greensand Way national trail. 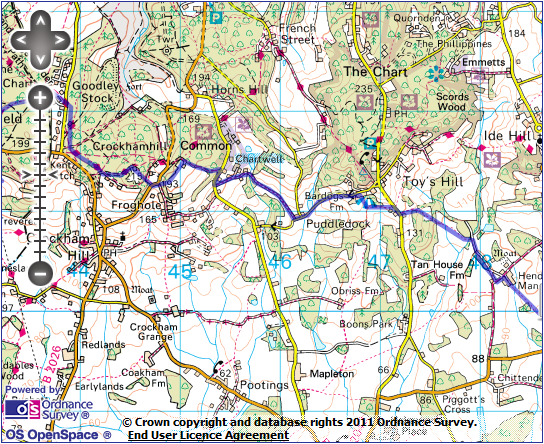 The route passes Kent Wildlife Trust’s Bough Beech Visitor Centre and Chartwell House. Getting home: Oxted is served, Monday-Saturday, by two trains per hour to London Victoria (39 mins) and one train per hour to London Bridge (32 mins). All trains call at East Croydon (20 mins), for alternative trains to London Bridge or London Victoria. 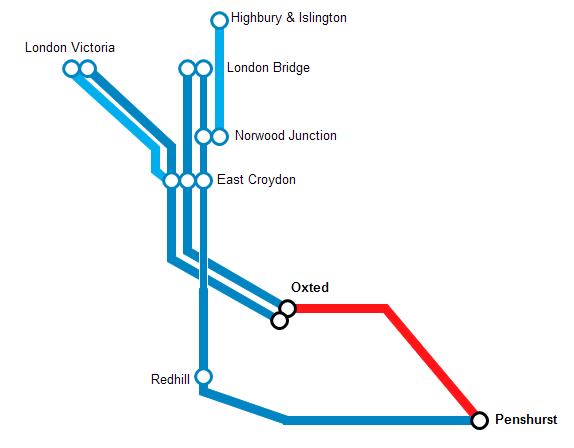 On Sundays, Oxted has one train per hour to London Victoria. Fares: The cheapest way to make the journeys for this walk is to purchase two tickets: first, a day return to ‘Edenbridge stations’ for £9.80 (child £4.90, railcard £6.45), which will cover you for most of the outward journey and all of the return. Second, you will need a Edenbridge to Penshurst single to cover the final leg of the outward journey, costing £3.00 (child £1.50, railcard £2.00). Arriving from London, exit from the platform and down the short station approach to the main road, opposite the Little Brown Jug pub. Cross and turn right along the pavement. Penshurst station is situated 2 miles away from the village it claims to serve – the hamlet here is called Chiddingstone Causeway. The railway line from Redhill to Tonbridge was part of the first line built to Dover, authorised in 1836 – it follows a remarkable straight route which leads to it missing most of the major settlements en route. So straight, in fact, that it was used as a navigation aid for aircraft heading out of Croydon aerodrome towards the Channel coast. narrow tarmac path across the fields towards the houses of the next hamlet at Charcott. On reaching the road turn right, then left at the bus stop to the edge of the village – after 100m the road turns right towards the pleasant village green and Greyhound pub – the route continues straight ahead on a gravel track towards Charcott Farmhouse. At a footpath sign, turn right off the track through a gate. Cross the large grassy field, keeping just to the right of the smart buildings at Charcott Farm aiming for a gate ahead. Passing through the kissing gate, immediately turn left (no sign) along a fieldside track. At the edge of the wood ahead, turn right on another track, which soon veers left to cut through the small wood. These scattered coppices which you pass in the early stages of the walk are the remnants of the huge wood which once covered all of the Low Weald – the name comes from an Old English word meaning forest (clearly from the same root as the German Wald). 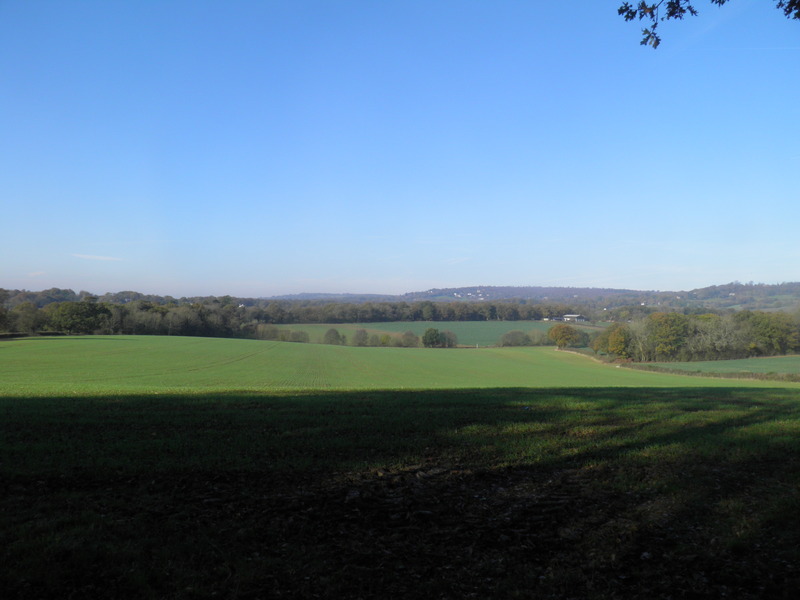 The High Weald hills, less touched by agriculture, have retained much more of their wooded cover. road. Cross straight over, taking the left-hand of the two paths signed ahead. The faint path passes left of a small clump of trees, then becomes a clear path along a narrow wooded strip. Pass through a gate, continue straight ahead at a cross-paths and pass through an open field next to the house at Little Sidcup. At the end of this field you join a track, turning right and soon joining a tarmac access drive along which you head downhill. At the road junction in the small valley, veer left. At the next road junction, in front of an 18th century forge house, turn right, signed to ‘Bore Place only’. This small road leads gently uphill for about 400m to the large complex of buildings at Bore Place. There has been a farm on this site since at least the 13th century, and the current complex is centered around a 17th century manor house, of which you will get occasional glimpses. This is now an organic farm run by the Commonwork Trust, which also acts as a conference centre and educational centre. Past the entrance to the visitor car park, turn left in front of the first set of buildings, then immediately right on a concrete track past a cattle shed. Keep ahead on the tarmac road to leave the farm complex. Past the final house the road becomes a hedged track. 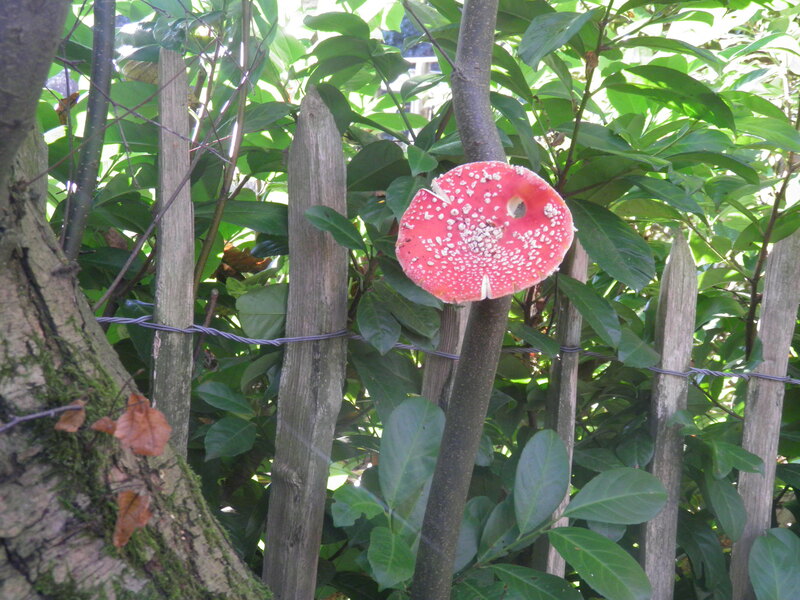 Follow this round a sharp corner to the left, climbing gently. 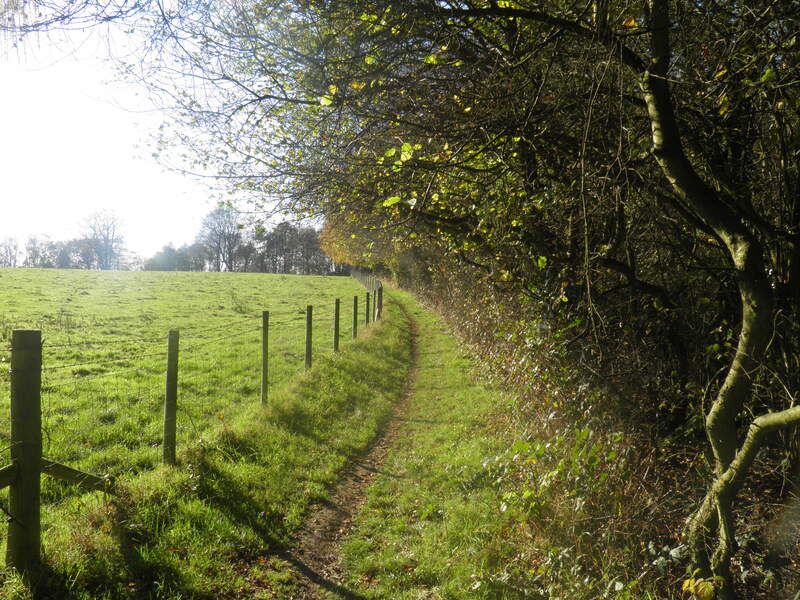 Through a narrow belt of woodland, where the track turns right, keep ahead over a stile by the gate, with the first sweeping views westwards along the hills of the High Weald. Turn left to follow the field edge. With glimpses of Bough Beech Reservoir to the left, descend to cross a small footbridge, then continue to follow the field edge ahead to a road. Turn left for around 100m, and then right down the small road to Bough Beech visitor centre. 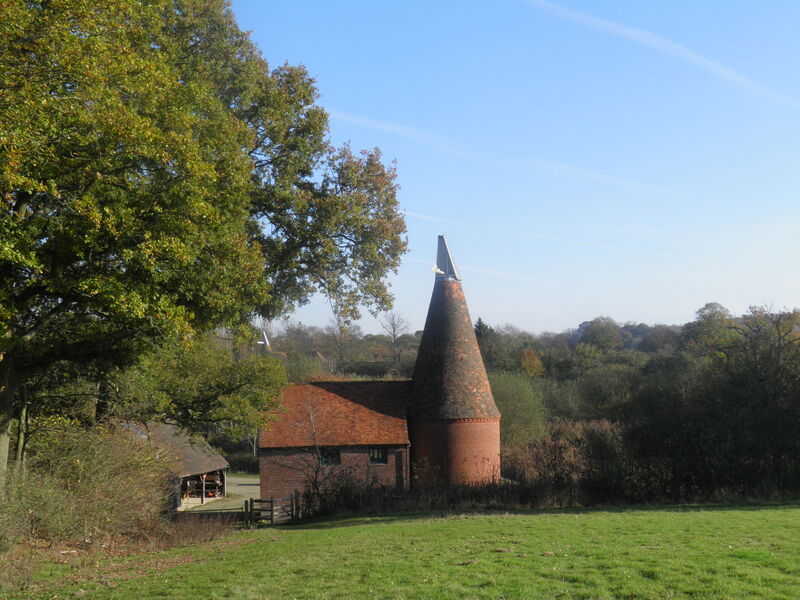 Run by the Kent Wildlife Trust, the visitor centre is housed in an oast house and provides information on the nature reserve which makes up the northern end of Bough Beech Reservoir. The wetland habitats are popular with dragonflies, amphibians and numerous species of birds. Pass to the right of the oast house and pass through a kissing gate, following the waymark straight ahead. At the field end, take the right hand path over a stile and through two metal foot gates. Then follow the left hand field edge to emerge on a road in the hamlet of Cooper’s Corner. Turn right to the road junction. Cross straight over the main road and through the kissing gate on the path through the wood ahead. On reaching the far side, veer left over a stile into open fields. There is no clear path here, but cut diagonally across the field to a pair of stiles next to the coppice on a low rise. Follow the edge of the coppice until the edge begins to descend the cut across the field to the gate visible in the far boundary. 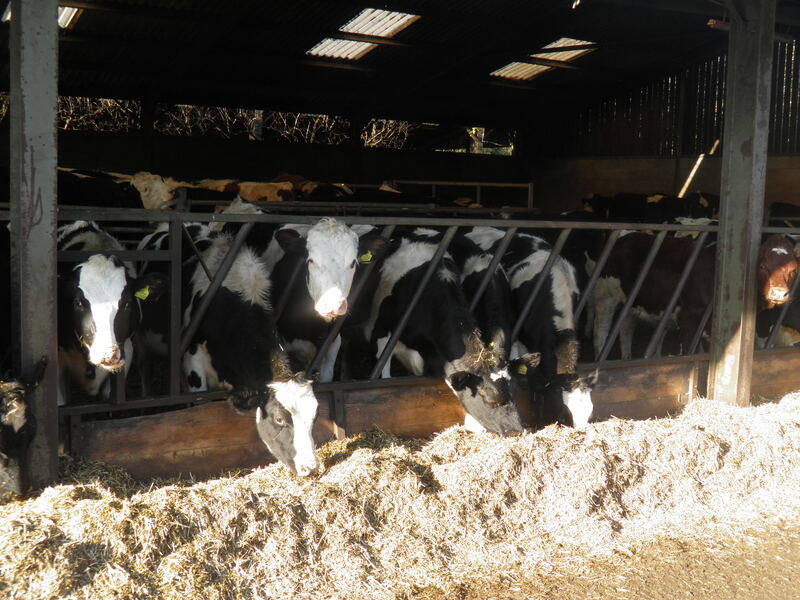 Through the gate, continue across a grassy area towards the buildings at Henden Manor and follow the concrete track between the barns and the immense cattle sheds. In front of the combined manor house and oasthouse, turn left along the drive, then on reaching the next house turn right (footpath sign). here, a well-waymarked path leads across fields and then climbs steeply to reach a road just below the village of Toy’s Hill. Turn right up the road, then very soon left on a path next to the drive to Alleydown. 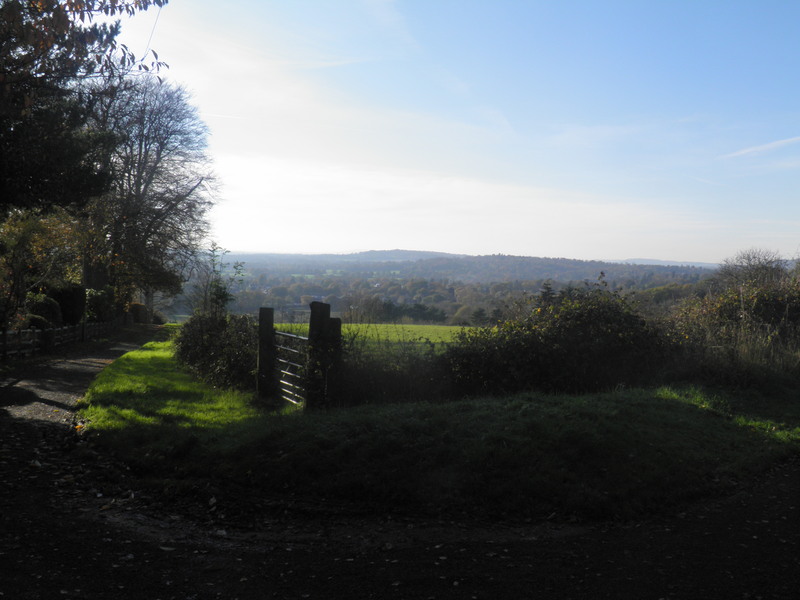 You pass through a footgate, pass along the fieldedge then drop to a stile into more open fields, with superb views south across the Low Weald. A second stile leads into a sunken path. Turn right, the path dog-legging up the hill to join a gravel drive and then Puddledock Lane on the edge of the village. Turn left, descending gradually to the sleepy hamlet of Puddledock. Keep straight ahead at the lane junction and around 50m on turn right on a fenced grassy track with a footpath sign. The track soon becomes a path, contouring along the edge of the hill. The path eventually drops into a small valley. At the gate it is worth a small diversion right on the National Trust path to admire the view of Chartwell across the lake, with a statue of Winston and Clementine Churchill beside the lake. Chartwell was a 16th century farmhouse significantly expanded and modified during the 19th century, when the gardens you can see here were also laid out. It was purchased by the Churchills in 1922 – supposedly Churchill did not like the actual house, but was so taken with the views that he bought it. The house was their main home, except during World War 2, when it was considered too exposed to Nazi-occupied France for safety. 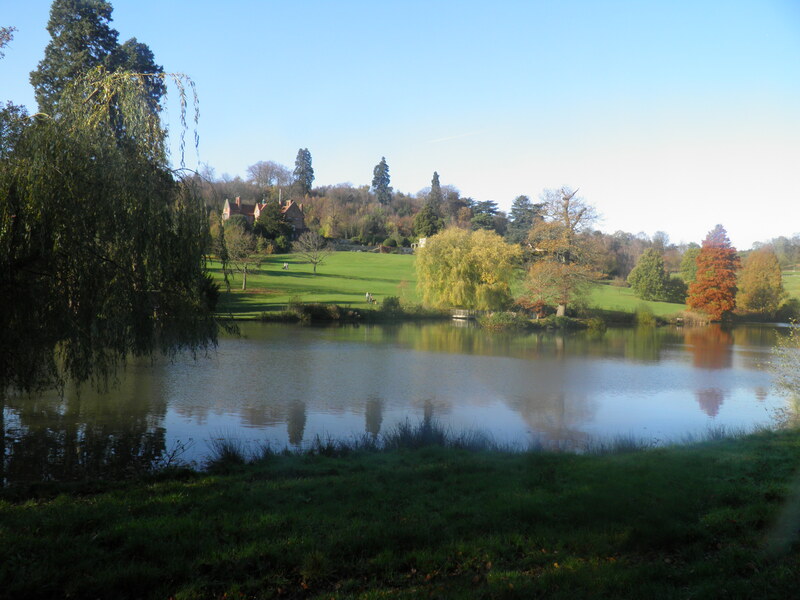 After losing the 1945 election, it was clear that Churchill could no longer afford Chartwell’s upkeep and it was purchased by a trust of wellwishers, with the Churchills paying a nominal rent. It passed to the National Trust after Winston’s death. Returning to the gate, continue left past a smart group of converted oast houses and along their drive to a road. Turn right, taking care around a blind bend and just after Well Cottage turn left on a signed bridleway (if you want to visit Chartwell, the entrance is a little further along this road). Continue straight ahead on the clear bridleway through the woods, ignoring National Trust path, climbing to an isolated house. Just past this house, where the path ahead drops steeply to a road, veer left on a level path. You soon reach a path junction on the edge of the wood. Turn right on the fenced path – at the end of the field continue straight ahead to descend steps to a road. Cross the road and take the footpath opposite, soon reaching a path junction. Cross the bridleway and take the narrow footpath ahead through the woods. Keep left on this occasionally hard to follow path to emerge on the broad Greensand Way next to a rather run-down house in the middle of the woods. From the house, follow its tarmac drive, eventually arriving at a track junction with an impressive six-way footpath sign. Take the right-hand footpath through a small car parking area then straight ahead on a path leading into the woods, signed as Greensand Way. The path joins a bridleway, veering left, and then continue to follow the main path as it curves north, crossing a clear track. At the next track turn right, following the Greensand waymark, past a woodland house. Through the kissing gate, take the lefthand track, rising slightly. 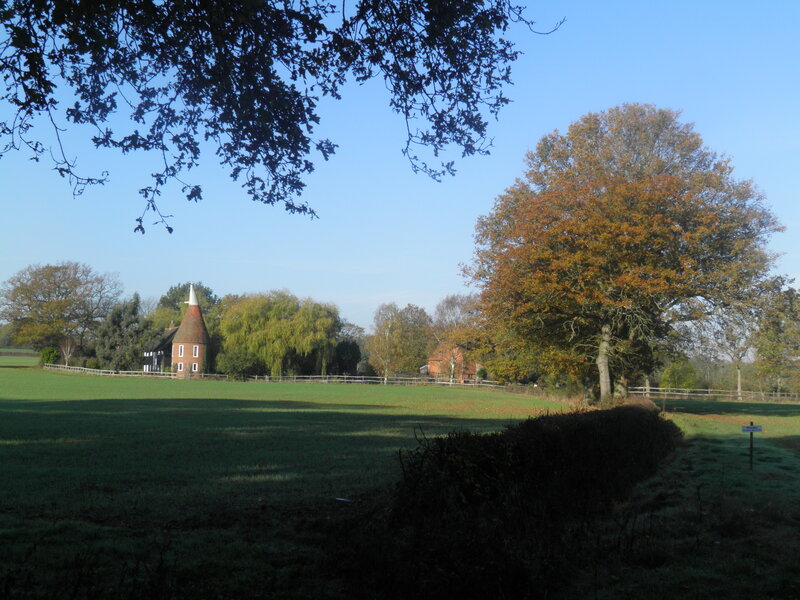 After 200m, turn left on a broad gravel track to join a road in the scattered village of Kent Hatch. Cross the road and take the bridleway to the right of the private road opposite. 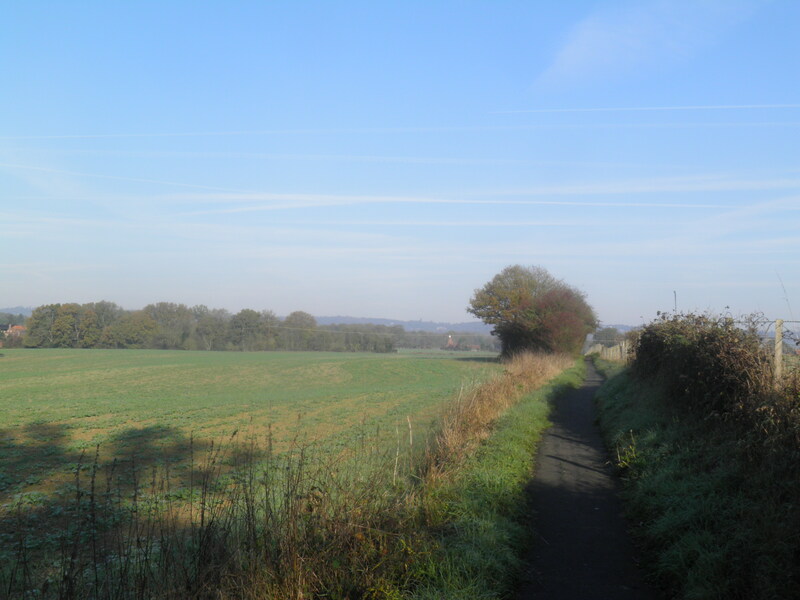 This broad path runs beside a fence to a large track junction, which also marks the boundary between Kent and Surrey. 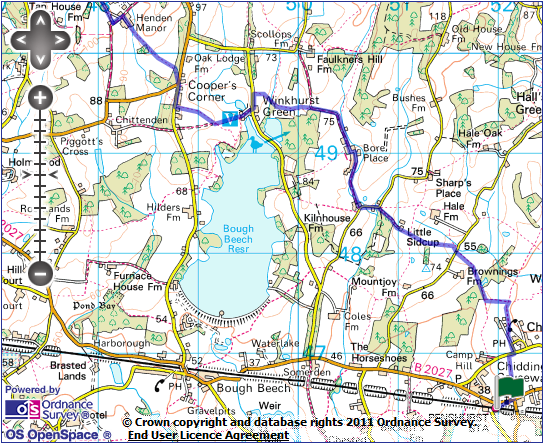 Follow the Greensand waymarks on the broad lefthand ride opposite. At a waymark post 200m on, veer right. 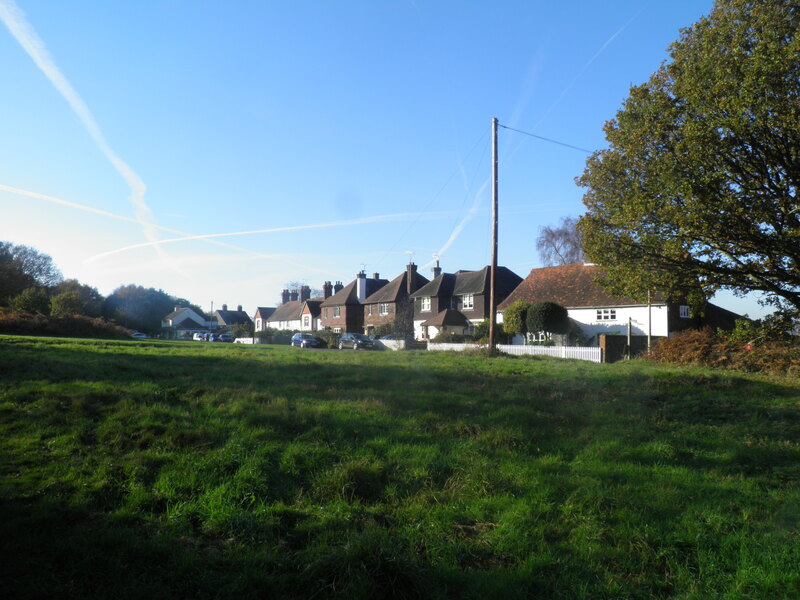 eventually emerge on a broader path for the last few hundred metres to the road in the village of Limpsfield Chart, next to its informal village green. Cross and take the road opposite along the edge of the green, along a row of cottages to the Carpenters Arms. Immediately after the pub, turn right on Post Office Row, then left on a gravel road in front of terraced cottages. Keep straight ahead over a small road onto a tarmac footpath. This runs alongside the busy Kent Hatch Road. At a bus stop at the top of the rise, cross the road and take the Greensand Way opposite. This crosses a drive, heads along the edge of a wood, passes a second house then on to a dive. Ignore the footpath dropping to the left and emerge at a crossroads by Arden Lodge with a fine view westwards along the range of hills. Turn right on a broad road. Just after it curves to the left, take the well hidden path to the right next to a house. This runs between fences and emerges on a minor road next to Pains Hill Chapel. Cross onto the open land of a golf course opposite, following waymarks to the next road. Turn right for 200m, then left on a signed bridleway (Greensand Way) – the left hand of two paths branching off the entrance to Stoneswood Road. Keep to the right hand path through the valley bottom. 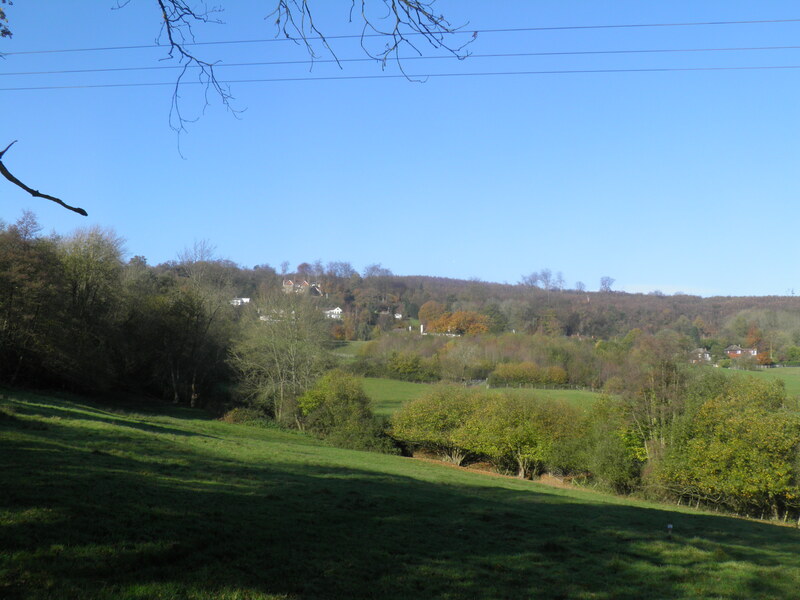 This attractive area is part of Limpsfield Common, used for grazing, collecting wood and quarrying stone by commoners since the 14th century. It is thought that early experiments with human-carrying kites were carried out here, including by Major Baden-Powell. Cross straight over a road, keeping to the left hand path. You emerge on a second road opposite a huge brick mansion in the style of a chateau. Take the small road opposite, ignoring paths to the left. Past Wildshaw the road ends, and you continue on a bridleway straight ahead. After 100m, the path forks and you veer left. Descend slightly to join another small dead-end road. This joins a larger road where you turn right, now firmly in the Oxted suburbs. After 50m, veer left on a signed bridleway. This path descends between fences, crosses a track and continues to drop, with glimpses of a chalk escarpment above Oxted. You eventually arrive at the A25 main road, next to a spectacular girder bridge carrying the railway line across the valley. Cross at the traffic island and take the snicket opposite. This leads onto a dead-end road of semi-detached houses. At the triangular junction turn right, and at the end, opposite Tandridge District Council’s headquarters, turn left up Oxted’s high street, a mix of Surrey mock-Tudor and 1960s utilitarianism. At the top of the hill, turn left to reach the station entrance – the London-bound platform is through the subway and the booking hall.